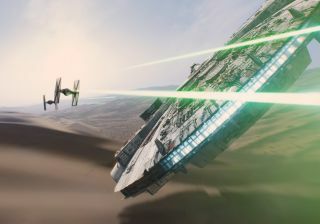 The Millennium Falcon flies again in a trailer for "Star Wars: The Force Awakens." The new movie directed by Ridley Scott and starring Matt Damon chronicles the harrowing adventures of a NASA astronaut stranded on Mars after his fellow crewmembers abandon the Red Planet during a storm. The film is based on the best-selling book "The Martian" (Crown Publishers, 2014). The movie is set for release on Nov. 25. "Star Wars VII: The Force Awakens"
Director J.J. Abrams' much-anticipated "Star Wars: The Force Awakens" brings new characters and old characters together 30 years after the events of "Star Wars: Return of the Jedi." Abrams and representatives working with the movie have been sporadically releasing some awesome-looking views of the set, and the first teaser for the new film premiered in 2014. The new movie is expected to come out in the United States on Dec. 18. How would the world react to aliens coming to Earth? "The Visit" tries to explore exactly how Earthlings would behave when confronted with intelligent life landing on the planet. The movie premiered at the 2015 Sundance film festival in Park City, Utah. See a trailer for "The Visit." "Jupiter Ascending" follows the life of a young woman on Earth destined for greatness, as predicted by a group of aliens. Jupiter Jones (played by Mila Kunis) goes on a journey to defeat the Queen of the Universe, who is attempting to destroy her. "Jupiter Ascending" is set for release on Feb. 6. While "Tomorrowland" might not seem like a space movie on its surface, it has major ties to NASA. The mysterious movie is at least partially set in Florida and involves a plotline that calls back to NASA's space shuttle program. Representatives with the film are keeping a tight lid on the high points of the plot, but did release a teaser trailer in 2014. The movie is expected to come out on May 22, in the United States. "The Avengers: Age of Ultron"
Although we don't know if "Avengers: Age of Ultron" will feature any space-specific shenanigans, we're pretty confident that space fans could find something to love in the new Avengers movie. Marvel always seems to sneak in some kind of space reference. The film follows The Avengers as they attempt to thwart Ultron, a sentient robot. The movie premieres on May 1. The animated movie "Ratchet & Clank" is based on the popular video game of the same name. The two protagonists, Ratchet and Clank, are on a quest with the Galactic Rangers to save the Solana Galaxy from a villainous alien, according to a film description. The new movie is set for release sometime in 2015. "The Day of the Triffids" (based on a book of the same name) is the science-fiction story of a plague of blindness that infects most people on Earth. Individuals on the planet are then forced to fight alien plants, called Triffids, in order to save humanity. The movie is slated for release in 2015, though a premiere date had not yet been set. "H." follows the story of two women who go insane after an apparent meteor strike in Troy, New York, according to a description of the film, which is set to premiere at Sundance this year. Details on the film are still light, but it might be one to watch in 2015. This adorable animated movie features a fat cat named Pig, a race of color-changing aliens, and a great adventure that brings aliens and humans together on Earth. "Home" is scheduled for release on March 27. Watch the "Home" trailer. "The Fantastic Four": The original "Fantastic Four" of comic book fame were granted their powers after exposure to cosmic rays during a space mission. But the reboot, set for release in 2015, changes the origin story slightly, opting instead to have the heroes gain their powers in special pods that transport them. Despite the change, we still think it looks great, and it's set for release on Aug. 7, 2015. Watch "The Fantastic Four" trailer. "Star Trek: Axanar": This fun looking "Star Trek" fan film should warp into theaters in 2015, and we can't wait to see what the filmmakers do with it. The producers of the movie successfully raised funds for the project via Kickstarter in 2014. Read more about "Star Trek: Axanar." "Alien Outpost": This movie, set for release in the U.S. and video on demand on Jan. 30, follows a group of soldiers 10 years after an initial alien invasion. The soldiers are being filmed by a "documentary" crew that followed them to one of the last alien holdouts. Read more about the movie and watch the trailer on IMDB.